Robert Martin is an Excel MVP and Microsoft Certified Professional. With a background in finance, he has worked as an IT director for an investment bank in the UK, and worked on charitable projects in Africa before turning to authoring on MS Office development. Ken Puls is an Excel MVP and a Certified Management Accountant in Canada. He works as the Controller of a resort, teaches Excel courses, and has authored all of the articles at the www.excelguru.ca website. Teresa Hennig is an Access MVP and president of the Pacific Northwest Access Developer Group and the Seattle Access Group. She is the lead author of the Access VBA Programmer's Reference series and is a lead on three national committees for INETA. Her company, Data Dynamics Northwest, provides data management solutions and consulting services. Part I: The Building Blocks for a Successful Customization. Chapter 1: An Introduction to the Office User Interface. Chapter 2: Accessing the UI Customization Layer. Chapter 4: Introducing Visual Basic for Applications (VBA). Chapter 5: Callbacks: The Key to Adding Functionality to Your Custom UI. Chapter 6: RibbonX Basic Controls. Chapter 7: comboBox and dropDown Controls. Chapter 8: Custom Pictures and Galleries. Chapter 11: Using Controls and Attributes to Help Your Users. Part II: Advanced Concepts in Ribbon Customization. Chapter 12: Advanced VBA Techniques. Chapter 13: Overriding Built-in Controls in the Ribbon. Chapter 14: Customizing the Office Menu and the QAT. Chapter 15: Working with Contextual Controls. Chapter 16: Sharing and Deploying Ribbon Customizations. Chapter 17: Security In Microsoft Office. Appendix A: Tables of RibbonX Tags. Appendix B: Tables of Tab and Group idMso Names. Appendix C: imageMso Reference Guide. Appendix D: Keytips and Accelerator keys. Appendix E: RibbonX Naming Conventions. Appendix F: Where to Find Help. 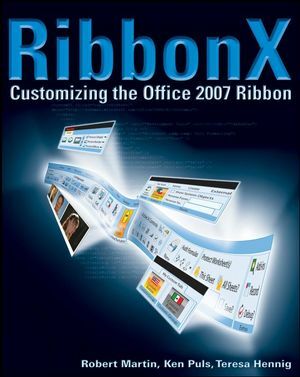 This file contains all the code, samples, and examples from RibbonX: Customizing the Office 2007 Ribbon. The figure was incorrectly identified in the write-up to REUSE fig 6-10, it SHOULD have indicated to use fig 6-14. Second bullet details: While Microsoft may not have a built in method to test a CustomView, it doesn't mean that we can't come up with a way to do it. One method I've used in many solutions is to create a CustomDocumentProperty in the workbook. You'd then need to modify the rxtglHideExpense_Click callback to write to the CustomDocumentProperty each time the button is clicked to record the appropriate state. Since this is saved with the workbook, you can then use the Workbook_Open event to check the state of the CustomDocument property. You could then pass this value to the getPressed routine to ensure that the state is set correctly. "Parent Objects of the button Element"
While Microsoft may not have a built in method to test a CustomView, it doesn't mean that we can't come up with a way to do it. One method I've used in many solutions is to create a CustomDocumentProperty in the workbook. You'd then need to modify the rxtglHideExpense_Click callback to write to the CustomDocumentProperty each time the button is clicked to record the appropriate state. Since this is saved with the workbook, you can then use the Workbook_Open event to check the state of the CustomDocument property. You could then pass this value to the getPressed routine to ensure that the state is set correctly. which is exactly what this button does!" within the screentip (as opposed to the supertip) will be ineffective.